At first4magnets we are proud to have worked with many inspirational creative people over the years including artists, sculptors, architects and designers and we literally jump at the chance to help with creative projects. After all, magnets are a wonderful tool for creating interactive works of art as they instil a sense of wonder and curiosity in anyone who handles them. Recently, we were approached by artist Jenny Hall, Creative Director at Craftedspace who had a vision to create an exhibition that explored mining and the links between destruction and construction by placing the audience centre stage as they interact with a semi-permanent sculpture. 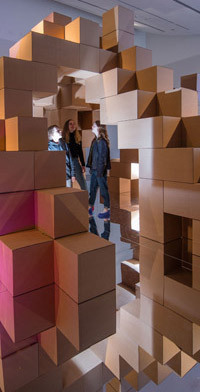 Jenny’s idea was to create a sculpture out of blocks held together with magnets – magnets that would allow the boxes to be detached, moved and reattached seamlessly allowing exhibition-goers to move, stack, explore and discover all within the exhibition itself. Six months after our initial meeting with Jenny, ‘Hollow’ was constructed at Aberystwyth Arts Centre and opened to the public. Each box includes 16 25mm diameter x 3mm thick self-adhesive neodymium magnets, which were custom-made for the design and build of Hollow. Each magnet, with a 5.5kg pull was strong enough to attract through the thickness of the industrial cardboard boxes to attract to another magnet on the inside of an adjacent box. Half of the 6,380 magnets used were supplied with their north pole on the adhesive face and half with the south pole on the adhesive face so that they could be strategically applied to the boxes so that they would attract rather than repel when arranged in a certain way. To enable Jenny and her team to easily identify one type of magnet from another, the north facing magnets were manufactured with a black epoxy coating and the south facing with a standard nickel coating. As you can see from the images, the arrangement of boxes and magnets meant that the structure is stable and sturdy enough for visitors to walk right through it. Hollow officially opened at 6pm on Friday, 1 April 2016 at Aberystwyth Art Centre where it will remain until 7 May 2016 before being dismantled and moved on to other museums and galleries in Wales. For further information and future tour dates, please visit the exhibition’s official website hollow.info.